I wish I could say I was reading something complex and perhaps in French but instead I am reading Collected Ghost Stories by M.R. James. I love ghost stories and am always in search of a new one – but it is neglected genre, probably because it is hard to write. 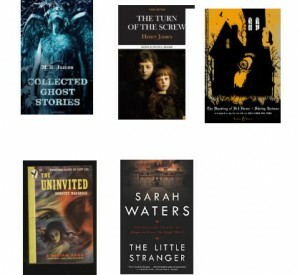 My favorites are The Haunting of Hill House (Shirley Jackson), The Turn of the Screw (Henry James), The Little Stranger (Sarah Waters) and The Uninvited (Dorothy Macardle). I just re-read two of M.R. James stories, hoping they would lull me to sleep but I did not choose wisely. They are unsettling to say the least: “The Tractate Middoth” and “Casting the Runes”. M.R. James was the Provost of King’s College Cambridge in the early nineteenth century, and on many a Christmas Eve would retire to his chambers and read aloud his latest ghost story to friends. His story “Oh, Whistle, and I’ll Come to You , My Lad” is hair-raising. The movie The Haunting is the best film adaptation of a ghost story I have ever seen. If you have not seen it, watch it, but don’t watch it alone. Also the ancient film The Uninvited with Ray Milland, which I saw when I was a little girl – it was released in 1944 and I probably saw it sometimes after that as movies were slow to come to the small town of Greenville. I mostly remember that it almost scared me to death. It’s a beautiful day and I’ll going out to shake the ghosts out of my head and look for something blue and white.